Spread across five blocks surrounding the large pool, these modern apartments provide comfortable accommodation within easy reach of shops, tavernas and bars. The poolside bar is great for a relaxing drink. My sister Sue and I have just spent a week at the sunshine studio`s and apartments and what a lovely week it’s been. Athena met us when we arrived she was lovely showed us to our studio which was very clean and spacious she also left us a bottle of water. We met Nicos Sula a very funny cheeky lady who does the cooking and Pedro’s the barman all very friendly lovely people very helpful. We also met really nice people and had good times in the bar. It was not far to walk to the main strip which we enjoyed a few times. We enjoyed a good breakfast in the Smuggler`s Louise is a lovely lady we also had a good night in Fagin`s. Brenda and Sue 7/6/13. The family love it so much! This was our 6th or 7th time we stayed at Sunshine because the family love it so much! The staff are friendly, talkative and very helpful. The staff are very welcoming when you first arrive, even if you do arrive at midnight. We found that all of the meals were excellent and affordable! There is something on the menu for everyone! We have never had any complaints about the cleanliness of any of the apartments we have stayed in. All of the facilities are extremely clean including the pool and toilets. The hotel is in the perfect location because you cannot hear the loud music from the clubs and bars. It is a short walk (5 minutes) from the sandy beach. Every so often there is a Greek Night which I have luckily been able to go to on two occasions. It is the most wonderful experience ever. Plate smashing, setting the floor on fire, Greek dancing and Greek food. I would definitely go back again next year! (For the 8th time!) I cannot explain how much I love staying in these apartments. 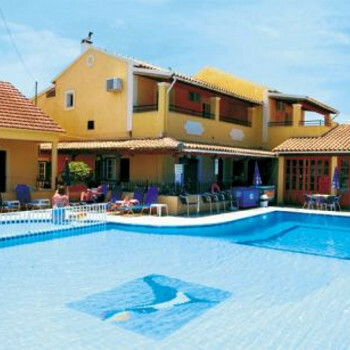 We booked this holiday at the last minute and chose the Sunshine Apartments because the reviews were mainly very good. We worried they might be quite a walk from the resort, but that isn't necessarily a bad thing. On arrival, we were greeted by Athena and shown our studio which was on the end of a terrace of four. There were 3 rooms: Kitchen/Diner; Shower/Toilet; Bedroom. All rooms were a good size with appropriate furniture and enough storage for our belongings. The ground floor terrace had a patio table and chairs. A fresh bottle of water had been provided by Athena. The bedroom had a wall-mounted TV that worked fine and had a remote. As we had arrived after midnight, we were pleasantly surprised to find out the bar was still open and served tea and coffee! The bar/restaurant area had more than enough room for the number of people in the complex and the service is excellent. The Pool is just outside of the bar, is a decent size and never too crowded. There were also more than enough loungers around the pool for sun bathing. The food served is excellent and good value for money, with a mixture of Greek and international offerings. The Sunshine Apartments are located about 300 metres from the main Canal d'Amour shops and bars, which means thay are close, but not troubled by loud music. The road to Peroulades runs by entrance to the complex, but the traffic only amounts to about 3 cars and numerous small scooters passing in a 5 minute period during the daytime (remember to walk on the left side of the road so you are facing oncoming vehicles). The nearest beach, Apotripiti, is 5 minutes walk and the beautiful coves of the Canal d'Amour about 8 minutes. Sidari strip will take you about 15 minutes and walking in the dark is no problem as there is street lighting all the way. Overall, our impressions after a 7 day stay were that we had made a great choice. The owners and staff are great fun and really look after their guests. The clientelle mainly consists of couples and families, some newbies like us and a lot of regulars who go year after year. If you are looking for basic but clean apartments and like to be made part of the family, the Sunshine Apartments are highly recommended. When we left after 7 days the whole management and staff waved us of with many hugs, kisses and manly handshakes. How many places care that much? the location is in canal lamour district,which is away from main resort of sidari,but plenty of bars,tavernas n shops. visited in may for late booked short break, wasnt expecting much as rated 2 star, but how wrong that can be, absolutely excellent, rooms clean and tidy, family run by extremely friendly family, mum and dad (sorry cant remember their names) and Dimitri their son and tony the barman, all so friendly, ate there most nights as food best we tasted and sooo much, will definately be returning. The appartment was tired and dirty. The hotel staff, with the exception of Tony, were without question the most unfriendly Greek people that I have ever met in 20 years of going to Greece. The complex is about 20 years old and it looks like the owners do not enjoy being in the hospitality business. Easily the worst holiday I have ever had. We have just got back from the sunshine apartments in sidari and i have to say it was the best holiday ever. The apartments are owned by a greek family, Athina, Nicos and their son Dimitri. The whole family are wonderful, extremely friendly and helpful. They cannot do enough for you and make you feel welcome from the minute you arrive. Tony works behind the bar from 6pm until you want to go to bed. He is brilliant. He will have a laugh with you, giv you adivse. We always went back to the bar after dinner because it was such a lovely atmoshphere. Tonys daughter nicole comes to the apartments some days and splashed around in the pool with my son and his friend. Special mention as well to Mimosa the wonderful cook, my husband wanted to bring her home with us because her cooking is so good. The apartment complex has only 17 rooms which we found to be great because you got to know everyone else that was staying there. We made some very good friends. The only downer with our holiday was that my 80 year old mom had a fall and broke her wrist and ankle but again Athina, Tony and the rest of the staff were so helpful. Nicos even ran my mom to the airport the day we came home because she couldnt get up the steps on the coach. We are definately going back next year, i am booking up as soon as i can because it is definately the best place to stay in Sidari. Oh and i havnt mentioned the greek night, best one i have ever been to dont miss it. We stayed at the Sunshine in June. Studios were very clean and staff very helpful.We hired a car for a few days and Athina(proprietor)was great, she offered us loads of advice on where to go and what to see, we weren't dissapointed, Corfu is beautiful!Tony the barman was great too, really nice bloke! The studios are a little way from Sidari itself, about a ten minute walk but theres plenty to do in the surrounding area, plenty of bars and tavernas. The studios are self catering but we had cooked breakfast every morning in the bar and it was beautiful and good value for money they also serve snacks and meals all very nice.There wasnt much entertainment while we were there but the bar area was lovely to go back to and have a chat and drink before going to bed.One thipng the brochure doesnt tell you abot these studios is the location? They are actually in the Canal d'amour area of Sidari, and its really pretty around that area the rock formations are fabulous. We had a great stay would definatley go back there. the rooms were spotless all the staff cleaners,cook,barstaff and owners were the freindlyest people you could meet the service and food was exelent. very happy with staff and accommodation. rooms were typical greek self catering; clean and adequate. the owners were greek and the whole family were very hospitable and not afraid to help out in any way! tony the barman etc, was very pleasant and helped out to the best of his ability! perhaps a bit too far from the center of sidari but nice and quiet to sleep at night!!! we would definitely go back; but probably in june as a lot of places and trips were not open or available at the beginning of the season! !